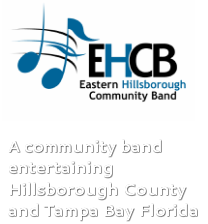 The Eastern Hillsborough Community Band is focused on bringing quality concert band music to the Tampa Bay area in Florida. Since our founding in 2009, we have become an integral part of Eastern Hillsborough County and perform throughout the region. ​Our members range from amateurs to seasoned professionals from a variety of backgrounds. Our vision is to foster the love of music, improve our musicianship and enlighten, entertain and inspire our audience. We also strive to have fun and build camaraderie among our members.